Personalized Embroidered Wedding Couple Heart Afghan. Love for each other should always be presented in beauty on a afghan and enjoyed each and every day. 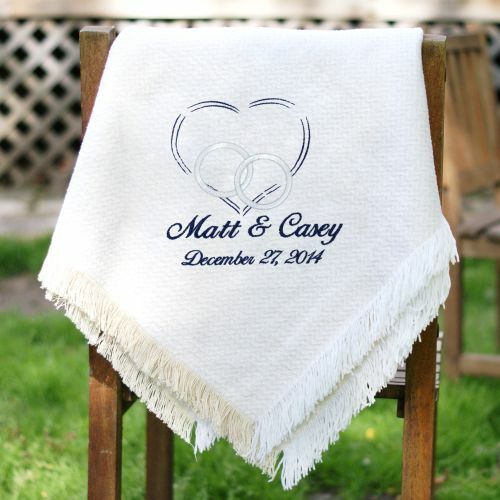 Decorate your favorite rocking chair or place this romantic wedding afghan at the foot of your bed as a constant reminder of how special the love of your life means to you. Show you wonderful love for each other with a beautiful afghan. The couple's names are wrapped in a golden heart and adorned with gold, loving doves. A lovely accent piece for any home. This is the perfect wedding gift to give to any one as a keepsake to last for years to come.